The flying narrative in this book is exceptional, some “don’t try this at home folks” yarns (flying the Auster along forest paths to avoid RAF Hunters, my instructor was not impressed when I tried to emulate this) as well as a wealth of tips & hints. Flying a low inertia microlight, I can’t attempt his setting the power once & bringing it all the way home trick….perhaps one day. Its a real pity that so few people know about this book. The flying dominates this so as a general read it could put non-pilots off , but its a hidden gem and I’d recommend it to any pilot or student pilot. This book has it’s own web site which is nice. On the site you can even get an excerpt of the book to read…don’t! Go buy the book instead, you won’t be dissapointed. If you’re learning to fly and having some problems with why parts of the technical exam are the way they are, then this book is worth it just for John Farley’s simple explanations of what should be very complex, like the drag curve for example. If John Farley had taught me maths at university then I would have got much, much higher marks. The first few autobiographical chapters are a good read for pilots in general; the technical parts are so easy to read yet impart so much information (oh, Trevor Thom, why couldn’t you write like this? ); and the final chapters on John’s thoughts on flying are real “why didn’t I think of that” head-slappers. This is the book that fellow students come up to you and tell you to read, so much so it’s almost mandatory (soon the CAA might insist we take an exam on it). The combination of this book, and an article in Pilot magazine, got me into microlight flying, but that’s saying the microlight community will take anyone. You don’t have to be a pilot to read this, it really stands up on its own, but read it as a pilot and you start to learn some salutary lessons like “having a pilots licence doesn’t necessarily get women falling at your feet” and “taking off in long grass, when overloaded, towards electricity cables is not good”. Laugh out loud funny, some people I know have read this book in one sitting not being able to put it down. You have been warned! Once described to me as “Two massive engines with a man sat astride them”, I have a suspicion that the Lightning flew not through any aerodynamic principle, but by sheer dint of the power that came out of the back of it. Either way, it was (and still is in the parts of the world where it still flies) a formidable aircraft. 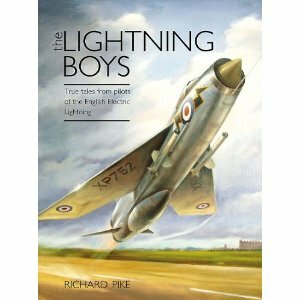 This book simply contains a range of short but true stories from pilots who actually flew the beast as their day job. Recalling an era of the RAF when the enemy sat beyond the iron curtain, and recalling various aspects of flying life, this is a superb record of what probably was a golden era. For me, the stories managed to overcome my own traumatic experience of the monster bought about by single-handedly having to clean one from top to bottom with Duraglit.